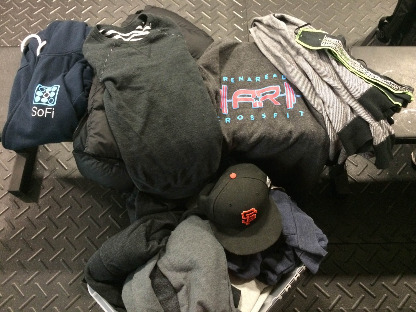 Arena Ready CrossFit - Lost & Found Quarterly Blowout Sale! Lost & Found Quarterly Blowout Sale! The Lost & Found is once again having a blowout sale! Anything that's actually yours is $FREE NINETY-NINE, and anything left at the end of this week is fair game for us to send to the Arena Ready Rack (aka Goodwill). So if you don't want to see Coach Molly or the Flying Squirrel wearing your favorite blazer when meeting you out for dinner, I'd suggest taking a looksy this week to claim your loot - there's a lot of nice stuff in there! *There is a 2 OH walking Lunge "penalty" for every time the KBs are set down during the Farmer's Walk (prior to completing the full 100m). No running allowed.